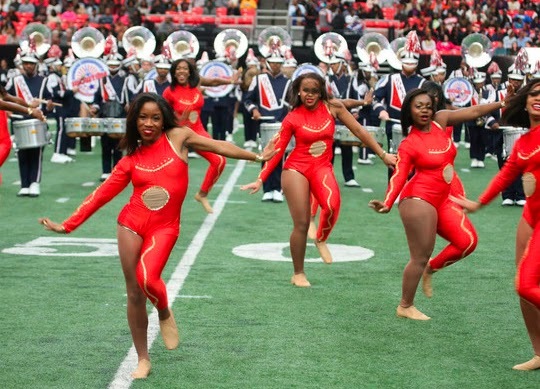 Nearly 60,000 fans packed the Georgia Dome to watch top marching bands from America's Historically Black Colleges and Universities (HBCU) rock the house at the 13th annual Honda Battle of the Bands Invitational Showcase on Jan. 24, 2015. More than 2,100 student musicians took to the field for a memorable mass band performance. The Marching Wildcats of Bethune-Cookman University performed at a record tenth straight Invitational Showcase; the Howard University Showtime Marching Band and Talladega College Marching Tornado Band performed for the first time. Tens of thousands of fan-produced social media posts using "#HBOB" helped spread the message around the world. Ms. Audrey Stradford was named the first-ever Honda Power of Dreams Award honoree for her lifelong dedication to serving HBCU students and the Tennessee State University community, and was awarded a brand new 2015 Honda CRV on the field. Honda provided more than $200,000 in grants to participating HBCUs during the program period in support of music education. The 2015 theme, "March On," encouraged student musicians and fans to follow their dreams despite whatever obstacles they may face. Fans were treated to an unforgettable performance by hip-hop legends ‪Doug E. Fresh and Slick Rick, and a heartwarming rendition of the national anthem by actress and singer Demetria McKinney. "Honda congratulates the bands that participated in this year's Invitational Showcase, and thanks all of the schools, students, alumni and fans who joined us to celebrate these amazing student musicians," said Stephan Morikawa, Assistant Vice President, Corporate Community Relations, American Honda Motor Co., Inc. "Honda is proud that the Invitational Showcase truly helped students realize what Honda calls The Power of Dreams." For highlights, connect with Honda Battle of the Bands on social media using #HBOB. For more information on Honda Battle of the Bands, visit HondaBattleoftheBands.com. Honda's long-standing commitment to the support and success of the nation's Historically Black Colleges and Universities (HBCU) began more than 25 years ago with the establishment of the Honda Campus All-Star Challenge, a program designed to showcase the academic gifts and prowess of HBCU students. American Honda began its support of Honda Battle of the Bands more than 13 years ago as an effort to support HBCU music programs. Honda seeks to be a company that society wants to exist, creating products and technologies that improve the lives of people while minimizing the environmental impacts of its products and business operations to ensure a sustainable future for society. Honda is also committed to making positive contributions to the communities where it does business, to socially responsible business practices and to the promotion of diversity in its workforce. From our involvement in STEM education and HBCUs to our support of pediatric brain tumor research, and support of volunteer efforts by Honda associates, including environmental clean-up activities, Honda believes in giving back to communities where it does business. Find out more at csr.honda.com.